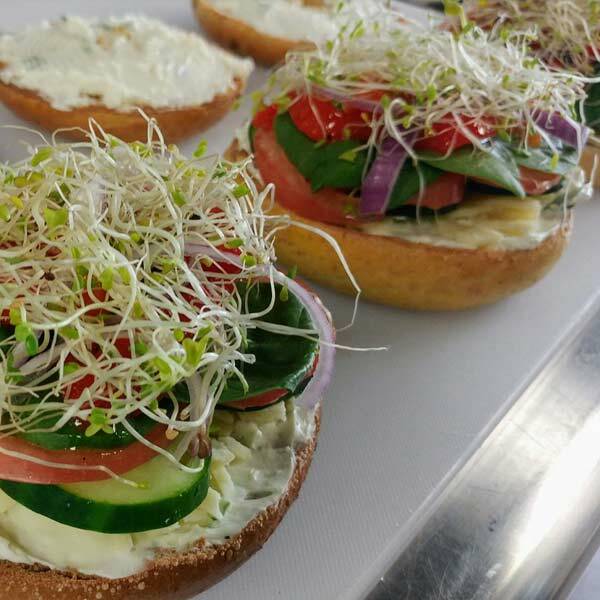 The Bagel Rack is a locally owned and operated company that focuses on fresh local ingredients. We are proud of our Lebanon roots which dates back to the 1930’s. Try any one of our 28 different bagel varieties baked on site early every morning. Combine that fresh baked flavor with one of our homemade cream cheese spreads; veggie, scallion, plain, honey walnut, chocolate chip cannoli, funfetti, bacon cheddar, blueberry or seasonal varieties. We offer signature sandwiches for all day breakfast and lunch or you can build your own. Think of the possibilities; 28 bagel flavors, 8 different meats, 6 different cheeses, plus veggies and spreads. Also on the menu are fresh made salads and soups. To compliment your meal we have hashbrowns or hand cut to order French Fries. Top off your meal with one of our fresh baked cookies; Hershey chocolate chunk, Reeses peanut butter cup, or Grammy T’s famous sugar cookies (our family recipe). Drinks include hot coffee, iced coffee, specialty coffee drinks, hot tea, brewed iced tea, specialty juices and soda. The Bagel Rack also offers Catering and Fundraising opportunities. Dine in or use the convenience of our Drive Thru. We are open 6 AM – 2 PM daily. We look forward for the opportunity to serve you.